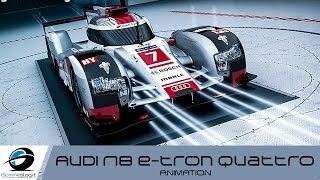 Audi R18 E-Tron Quattro 2015 though is another model inspired by turbodiesel engine but this time company paired it with an electric motor. R18 to its own badge successfully holds the medal of winning 15 major endurance events that also includes the four 24 hours of Le Mans races. As the car lovers are well aware about the knock of 2015 World Endurance Championship, Audi released the revised version of the R18. Definitely the aim is to take the earned badge to a next level and with increasing competition expectations are too high, let us see what all this revised version brings for its followers. Definitely the aim is to take the earned badge to a next level and with increasing competition expectations are too high, let us see what all this revised version brings for its followers. 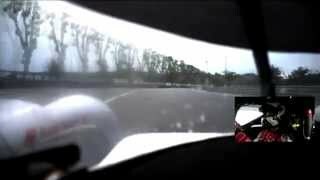 Like the rest of the years, no details or photographs have been provided linked to interior of Audi R18 E-Tron Quattro 2015 but being a revised endurance racing version it is expected to be like its predecessor from last year. A Cluttered dashboard, steering wheel mounted with numerous functions and controls and a small display enabling the driver to have a sneak at the vital information. Sits will bring comfort for the long endurance stints while the cockpit is anticipated to be wrapped by cloth and Alcantara. Apart these all speculations one thing's for sure and that’s, there won’t be any fancy to entertain the riders. The interior will be solely consumed by information and comfort features. 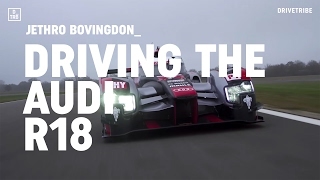 For a guy next door the glimpse of Audi R18 E-Tron might resemble to the last year’s model but from an engineer or a car lover’s perspective, every inch has been modified and redesigned for better performance. From distance noticeable changes comes in air inlets in wheel arches getting a larger size, redesigned splitter and the headlamps coming with dual technology system. One being the Matrix LED while the second Audi Laserlight technology giving the driver a clearly visible boulevard. New front wings, side pods and the compact engine cover are also part of the revision. At the rear revised edition holds changes made in diffuser, exhaust pipes and fenders. An upgraded 4.0 liter V6 turbodiesel engine is splattering a whooping 550 horsepower throughout the Audi R18 E-Tron Quattro. This is indeed a major change for the Audi’s model. TO support this power system architecture is also been designed in a way to reach the estimated top speed of 200 mph and the 0-60 mph sprint estimated to be at 3.0 seconds. As per company’s estimations with this revised version they have increased the amount of energy per race lap at Le Mans from 2 to 4 megajoules. 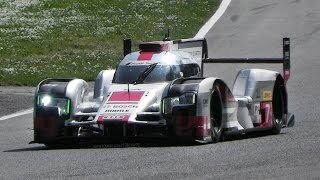 As far as competition for Audi R18 E-Tron Quattro 2015 is concerned the model might have to face a good battle with Toyota TS040 Hybrid, Porsche 919 Hybrid and Nissan GT-R LM Nismo.